WICHITA, Kansas, November 12, 2010 (ENS) – Up to 1.1 million acres of prairie in the Flint Hills of Kansas could be protected under the first National Wildlife Refuge unit designated by the Obama administration. To create the new protected area, the U.S. Fish and Wildlife Service will establish a voluntary conservation easement program in eastern Kansas. The easements are binding legal agreements that prohibit subdivision and commercial development, but allow for continued agricultural uses such as livestock grazing and haying. Secretary of the Interior Ken Salazar announced the creation of the Flint Hills Legacy Conservation Area this morning at the Great Plains Nature Center in Wichita. “Thanks to the tireless efforts of private landowners, stakeholders, state agencies, and the U.S. 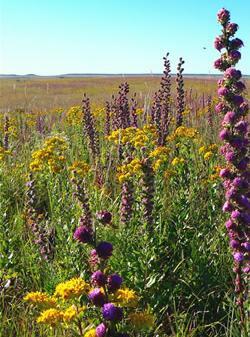 Fish and Wildlife Service, the tallgrass prairies of the Flint Hills will forever be protected as a crown jewel of America’s Great Outdoors,” said Salazar. Salazar said the purpose of the Flint Hills Legacy Conservation Area is to acquire and protect up to 1.1 million acres of habitat through voluntary, perpetual conservation easements. The conservation area is narrow band of tallgrass prairie that extends from the northern to the southern border of the state in eastern Kansas. The easements are expected to protect habitat for more than 100 species of grassland birds and 500 plant species, including 90 native grasses. In its environmental assessment and land protection plan, the Service listed guarding against climate change among the purposes of the Flint Hills Legacy Conservation Area. The easements also are intended to ensure that the region’s sustainable ranching culture will continue. Easement values paid to property owners are determined by appraisal and typically are about 30 percent of the property’s full-market value. Land ownership and property rights, including control of public access, will remain with participating landowners and the properties will remain on local tax rolls. The owners also will be responsible for grassland management activities such as invasive plant and tree control, grazing, and prescribed fire. In the afternoon, Brownback joined Salazar, Kansas Governor Mark Parkinson, and Secretary of Health and Human Services Kathleen Sebelius, the immediate past governor of Kansas, at Tallgrass Prairie National Preserve, about 80 miles northeast of Wichita, to break ground on a new visitor center and administrative buildings. Ceremonies under tents south of a historic limestone barn took place within the footprint of the new buildings that will be constructed beginning in spring 2011. The lands east of the Rocky Mountains were once a vast sea of grass extending to the forests of Kentucky and Ohio. 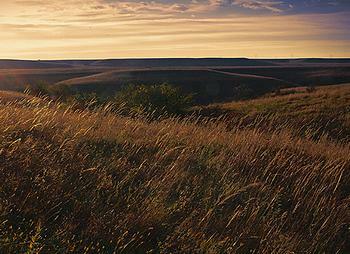 The eastern third of this vast grassland is called the tallgrass prairie, often called the “true” prairie. As settlers moved westward during the 19th century, they found the rich soils associated with the tallgrass prairie ideal for growing crops and converted much of the original prairie to farmland. Today, less than four percent of the tallgrass prairie remains – 80 percent of it within the Flint Hills of eastern Kansas and northeastern Oklahoma. The project boundary includes almost 45,000 acres of existing conservation areas managed by The Nature Conservancy; the U.S. Department of Agriculture; the Kansas Land Trust; and the Ranchland Trust of Kansas, which is an affiliate of the Kansas Livestock Association.